All Marquees come complete with poles, guys and pegs. If mallets or sledgehammers are required, they should be ordered separately. 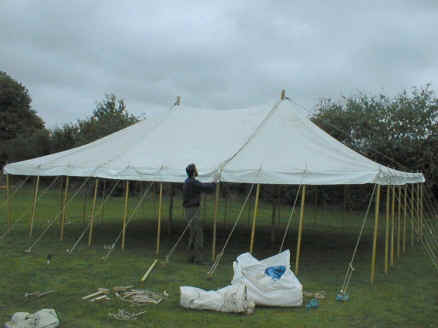 DA1 Marquee, Large & Heavy, 32’x16’x12′ Difficult to erect unless expert! 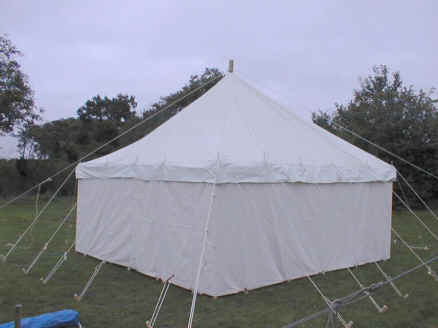 DC1 Marquee, 30’x20’x12′ White, Sectional marquee, 4 separate walls. DC1 can be erected either as a 20′ x 20′ or 20′ x 30′ marquee. It is fairly easy to erect if you know what you are doing, and has removable walls for those lazy summer days. DF1 is a small version of DC1, measuring 15’x15′. As the name suggests, these are good for parties, but can be used on camp. 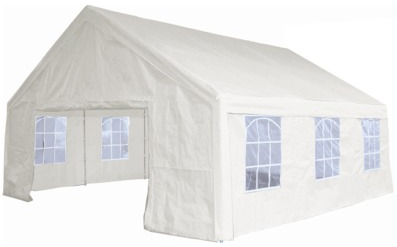 Ours come with tiedowns, which must be used to stop the tent blowing away in the wind. The walls and front are removable. These are only suitable for sheltered conditions!